Downbelow’s Go Pro crew has been cooking recently, helping scuba divers make the leap from recreational to professional diving. 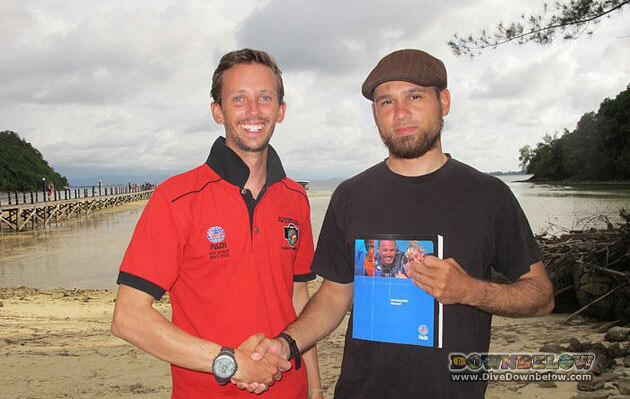 Recent graduate Noah became a PADI Divemaster just last week. “Well done to Noah,” said resident PADI Course Director Richard Swann when he congratulated Noah on joining the realm of pro scuba divers. Paul Jones, Noah’s qualifying Instructor, was also on hand to see him become a consummate diving professional. “Great effort,” said Paul who is himself a Downbelow Alumni. Downbelow’s has a regular schedule of Instructor Development Courses, the next installment of which is coming up in less than 2 weeks. If you want to join the exciting industry of scuba diving, drop us an email or visit our offices, and let’s talk about how you too can Go Pro with Downbelow.